In the haste of last minute work, when I and my friends rushed our submission throughout the night till the midday, I came back to my hostel only to stand in front of the room without the room key. In that tiring and sleepless work, I forgot to get my key from my friend who left in my room to complete the work while some of us went ahead to take print out of the work. So when people are tired, we don’t remain the commanders of things around anymore. I regretted to have not remembered to ask the key and it made me feel sick with self disgust. I couldn’t control my emotion when all that I needed badly was a sound sleep for certain time. I looked for anything that could allow me to break the lock after I called my friend several times. He tells me next day that he had fallen asleep right after the college. Finally I succeeded in breaking into my own room and to my utter disgust, my room was dirty, in fact so dirty with trashes of papers and glue. We made the model in the morning and since, room has not been used which meant it was not cleaned. After shoving off the paper pieces, empty glue containers and thermocol, I dozed off. At around dinner time, I was woken up my friends much to the dismay of my peaceful sleep. After washing my face properly which I did not commit to in the morning, I headed towards the community center which is located few distance away from my hostel. I had to get some money and I wanted to eat something good after having worked whole night. On the way back to my hostel, I dropped on the vendor who was selling the ‘locks and keys’. As I stood looking over the locks and keys hanging on the rack, this small kid came running there like what shopkeepers normally do on seeing some customer about to buy their goods. I picked up a lock and asked him the price. He hammered Rs. 70 which I managed to bring down to Rs. 50. There wasn’t much hesitation or bargaining frustration in him which most Indian vendors possesses. Few months ago, I went to buy shirt in Sarojini market, and this young man began pestering me to buy a goggle. To fan him off, I tried my own strategy of agreeing to buy the goggle at Rs. 100 which he charged Rs.690. and there I was after so much pestering from the guy with the goggle at hundred rupees. I was not so clear and clean with my head. The eye lids were still giving in. 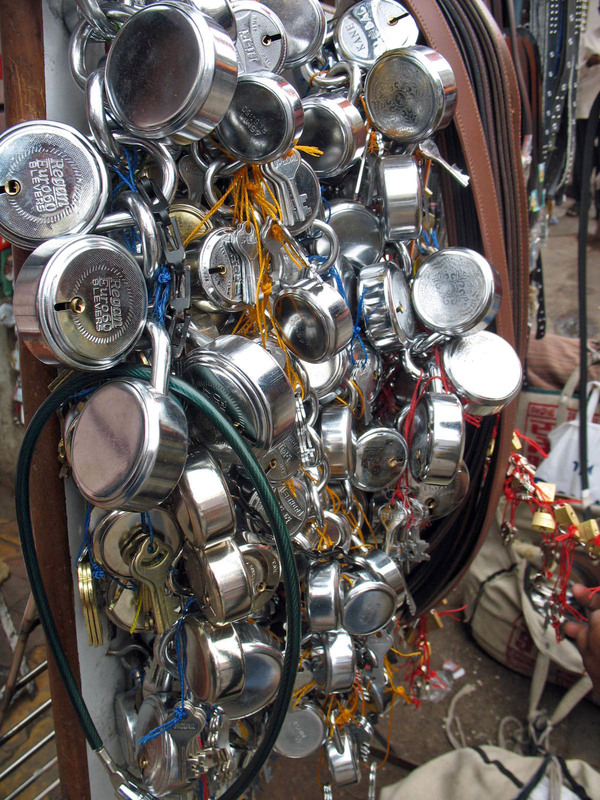 As I climbed back on rickshaw, the rickshaw paddler asked me how much I paid for the ‘lock and key’. I was checking the lock meanwhile when I found out that it was not working properly. I went back and to my utter disgust, the vendor-boy was replaced by an elderly man. He was astonished to see the lock which he felt that he didn’t sell to anyone. It did not take so long before we could clear out the situation. He was apparently unaware that someone disguised him and sold the good to me, and that con man ran away with the money. This is not the first time I have fallen in such pity swindles in front of such people. Someone selling the locks left his own shop unlocked, so I couldn’t do anything than to claim that I already purchased the items.